Does anyone else just love the heck out of Influenster like I do? I have been a member with them just about 18 months and have been invited to try some pretty awesome products. 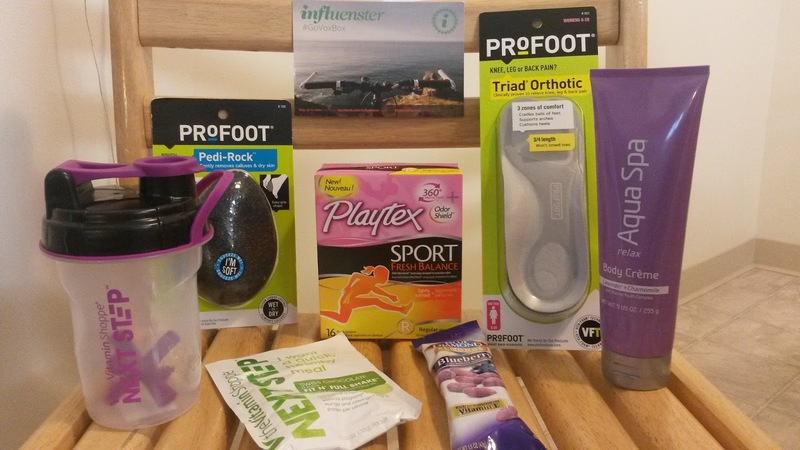 This month I was invited into the GoVoxBox which included some awesome products geared towards what I would call an active lifestyle. This made me super happy due to the fact that I am premiering a new series on Friday which is going to be geared towards a healthier lifestyle on a budget. Before I get into the goodies I wanted to talk a little about what Influenster is and why you want to join! As stated on the website, Influenster is a community of trendsetters, social media masterminds, and educated consumers who live to give opinions of products and experiences. So basically this a cool place to share your reviews on products and influence others to try new things. The more you influence the more opportunities you get to try out new products that come via a VoxBox. Now for the goodies. My VoxBox included 7 full size products. Also included were 2 coupons. Looking into the box I was super excited at what I had to sample. Playtex Sport Fresh Balance Tampons - I always love to try new feminine products. I am working on leading a healthier lifestyle so I am excited to try these in my healthy adventures. Price: $10.49 for 32. There are some wonderful products here that I cannot wait to try out! All of the products included came out to $43.60. That's pretty sweet! I can't say it enough. I LOVE this program! Please check it out if you are interested in trying new things and sharing it with the world. I am gonna go and tinker with all of the products! Have a wonderful Wednesday and stay tuned for my Friday premiere!